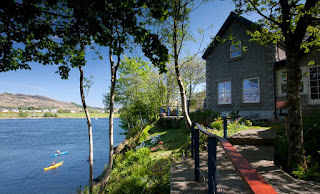 Highland Holiday Cottages offer magnificent self catering accommodation in Connel near Oban. Our cottages in Argyll enjoy stunning views over Loch Etive and the Falls of Lora. Cnocaraun sleeps up top 4 people and boasts lots of original features. The patio enjoys far reaching views over Lismore and the hills of Morvern. You can unwind in the living room which comes with leather couches, an open fire, Freeview TV with Netflix and a DVD player. The dining room comes with an original fireplace and a well-equipped kitchen comes with a range of excellent appliances: microwave, fridge/freezer, dishwasher, Senseo coffee machine and halogen hob with double oven. Cnocaruan Sea View sleeps up to 4 people and enjoys breathtaking views of The Falls of Lora. You can relax on the patio and admire views over Mull, Lismore and the hills of Morvern. The living room comes with leather couches, Freeview TV with Netflix and a DVD player. A well-equipped kitchen comes with a range of appliances: microwave, fridge/freezer, dishwasher, Senseo coffee machine and halogen hob with a double oven. You can visit lots of great attraction while staying with us. Dunstaffnage Castle is 2 miles west of Connel and is perched on top of a rocky outcrop. Falls of Lora is 5 miles north of Oban. The loch joins the sea via a narrow channel partly blocked by an underwater rock ledge. When the tide flows in and out, water pours through this bottleneck, creating spectacular white-water rapids.